The Marine Mammal Center in Sausalito, CA rescues, rehabilitates, and releases mammals that are injured, ill, or have been abandoned. They conduct globally recognized scientific research and inspire and educate over 100,000 visitors per year. The decision to implement a digital program onsite for visitors was twofold: First, educate the visitor around MMC’s scientific and medical work. Second, provide a point of action to increase awareness and inspire everyday actions for healthier oceans. Introduce the importance of their fish kitchen and food in general in the health and rehabilitation of patients. 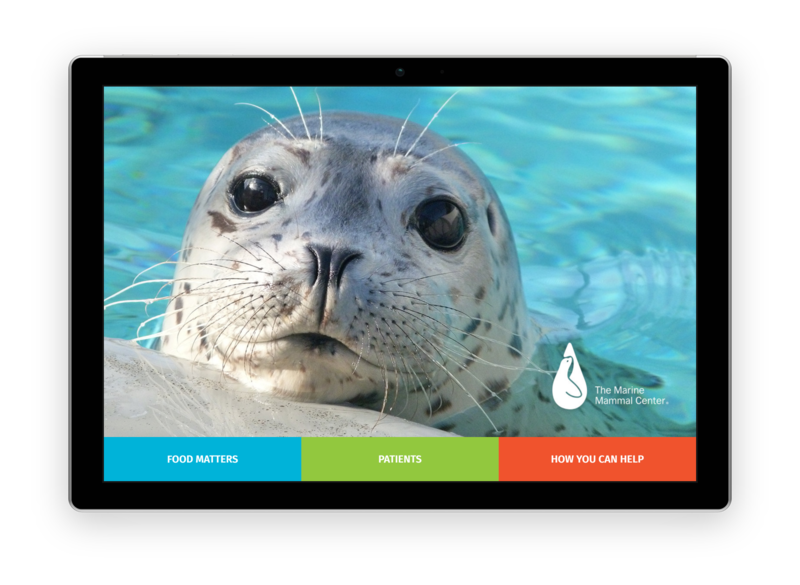 Provide visitors with a list of concrete actions they can take to support the MMC’s efforts and help protect our oceans and marine life. CultureConnect’s applications are device agnostic – ultimately, the MMC team chose an MS Pro tablet in an off-the-shelf weatherproof kiosk. The application was published in ‘offline mode’ – meaning it could run on the device without the internet. Whenever the MMC team wanted to sync new content or the user data & analytics, they could briefly connect to the CultureConnect CMS and make that update. In the Meet the Patients section, visitors learn about the environment, the patient’s illness, treatment, and recovery. This part of the app is a very powerful reminder of how our decisions impact the planet. The Sustainable Seafood Trivia Game, the MMC staff offers visitors a fun way to learn about sustainable seafood choices. 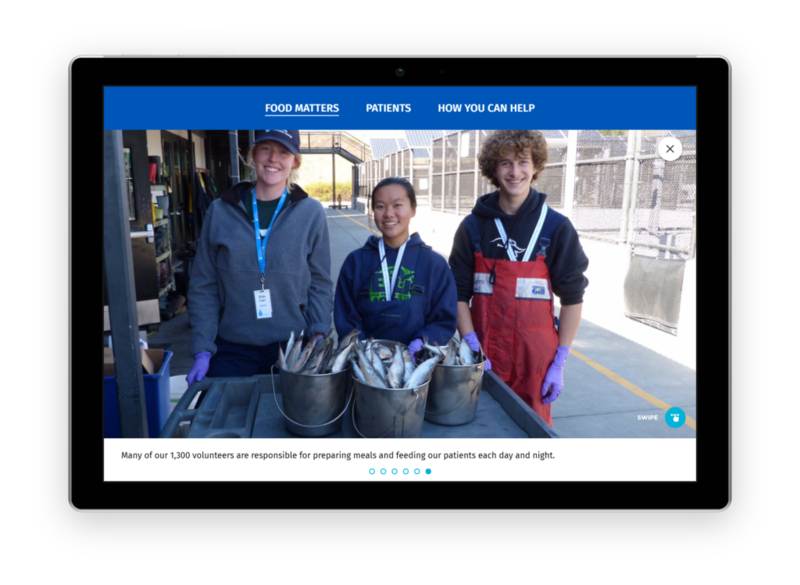 In a playful setting, visitors can discover how to order fish at a restaurant or market that will help contribute to healthy ocean populations. Once you’ve completed the quiz, you can learn how to take action today. 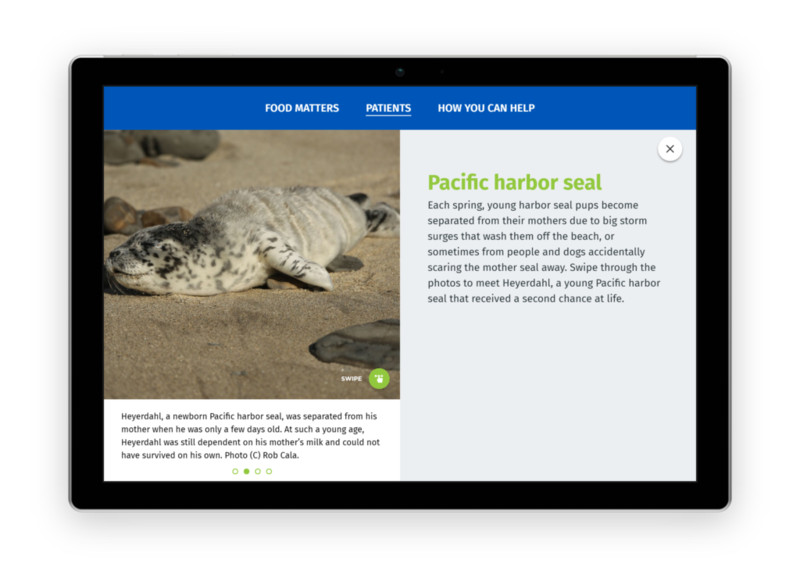 From Adopt-a-Seal to practical instructions about how to behave near marine mammals, this section is devoted to enabling and encouraging action. After the Marine Mammal Center launched their application in 2017, they used the data and analytics dashboard to measure visitor engagement. This has helped them evolve content and plan for additional digital experiences launching in 2018.